Do you remember…. I had told you that being thai maasam we draw huge kolangal on Tuesdays and Fridays in our courtyard? Today is Tuesday na, so, I was vested with the duty of drawing one. I had practiced a huge kolam. I am bad at pulli kolam (Dot Kolam). I used to argue that ones creativity will not come out through dot kolam. It is for muggers and not for creative heads like me! Later I admitted that I did not put dot kolam more due to laziness to learn one. Besides, it is very difficult to get the dot in particular and the kolam in general straight. Finally, I took it as a challenge to practice and master dot kolam! With confidence ahankaara, I got up early in the morning. I was too excited that I did not care about how I looked. I was supposed to draw kolam on road, but, that did not motivate me enough to even comb my disheveled hair. To add on, I was wearing a faded almost-fluorescent-orange salwar suite which would be ages old! I was at the peak of my confidence when I started to put the dots. From my angle, it was looking beyond perfect. But, when I looked from a distance, I realized that I had not drawn in the center of the courtyard. My ahankaara died at that very moment. I was left feeling bad; too embarrassed to wash and re-draw. 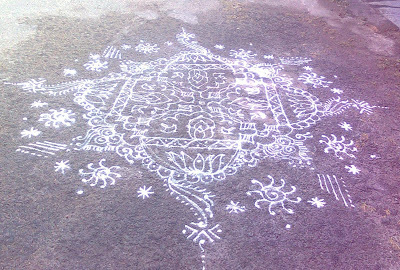 After all, I have a good reputation among neighbors when it comes to drawing kolam. Calling all the possible Angels to cast some magic, I started. I completed the pulli kolam part. I felt dissatisfied to the core. Then, I started to do extend it with my free-hand designs. Wow!!! I felt as if all the Angels were conspiring together to make my kolam look at its best. Ahankaara started to show its head. But, I weeded it off. It was, now, a foreigner slowed his Innova car as nearing our home. I thought he was going ask for some address. Instead, he parked his car a few steps ahead of our home and asked my mother, “Is it ok… Hmm… Can I….” He swallowed his sentence and started to do some gestures poiting to my kolam and my camera, when my mother directed him towards me. By pointing to the kolam he said, “I…. hmmm…. Looks good…. A photo?” More action than words! Why is an Englishman so nervous to talk in English, I thought. He praised my kolam and took its snaps. I came to know that he is an American married to an Indian whose relatives stay in a street next to ours. We exchanged our names and while saying goodbye, he said he will remember my name. Well, I really don’t understand why people still have this notion that Indians cannot speak English, especially those who live in a small town like mine. Why don’t they understand that most of the Indians think in English? They study in English medium and read English books. Almost every Indian can understand English and manage to speak too, at least in broken English. Some have their nest built in the Blogosphere too! I do agree that there are many who can’t speak English well. But, I am concerned about this notion – A notion that people in the metros and cities are well educated and can speak English where as people like me who live at smaller towns can’t. It’s the time to ward off such thoughts. Aren’t there many people who have always lived in cities, yet struggle to speak in English? Nobody can be judged by their looks or the place they live. It is education coupled with the thirst to learn and master the language that enables someone speak English; not geography. Of course, confidence matters too.